Week 30 is Exhibition Week! Here’s the schedule for next week – we hope to see you all at Exhibition Night on Wednesday night! On Friday afternoon our whole school will be walking to see the new campus on Douglas Ave. and then to Del Aire Park where we will end our day. Please make sure to sign the green permission slip that your kids received in advisory this week! Thank you!! All summer internship placements can now be found on the real world learning website at http://www.dvrealworldlearning.com/internship-opportunities.html. Interested students should apply to Ms. Morse at nmorse@davincischools.org with a resume and cover letter by April 17th. More details can be found in the attached flyer. Would you like to learn more about the Da Vinci Extension (“DVX”) programs offered at Da Vinci Schools? Please join us for an information session on March 30th at 5:30 PM on the Da Vinci Science campus. This meeting is open to all sites and all grade levels. To learn more about the program please visit http://www.davincischools.org/extension.shtml or email kmerritt@davincischools.org. The last week of March will be a regular schedule with Senior Beach Day on Friday! The FRC Robotics Team is Competing at Cal State Long Beach This Weekend You can follow the team on their Instagram at https://www.instagram.com/team_4201/ Good luck Vitruvian Bots! Boys Volleyball Varsity beat New Roads 3-2 onm Tuesday and on Thursday varsity beat OC Christian 3-0. Softball On Thursday, the team lost to Lennox Academy ,13-5. Track Congratulations to our track team for another outstanding performance this Wednesday! We would like to give special shout outs to DVS athletes who are currently ranked top 8 in the league: Angela Magat (3rd place in 100 Hurdles, 5th place in 300 Hurdles), Belen Blanco (6th place in 800m), William Henriquez (2nd place 110 Hurdles, 4th place 300 Hurdles), Marco Marsella (4th place 100 Hurdles), Boys 4x100m relay (6th place), and Boys 4x400m relay (6th place). We are also proud to have 13 students who ran their personal best times this season! Archery Da Vinci took first place at the Olympic Archery in Schools LA Conference Championships! 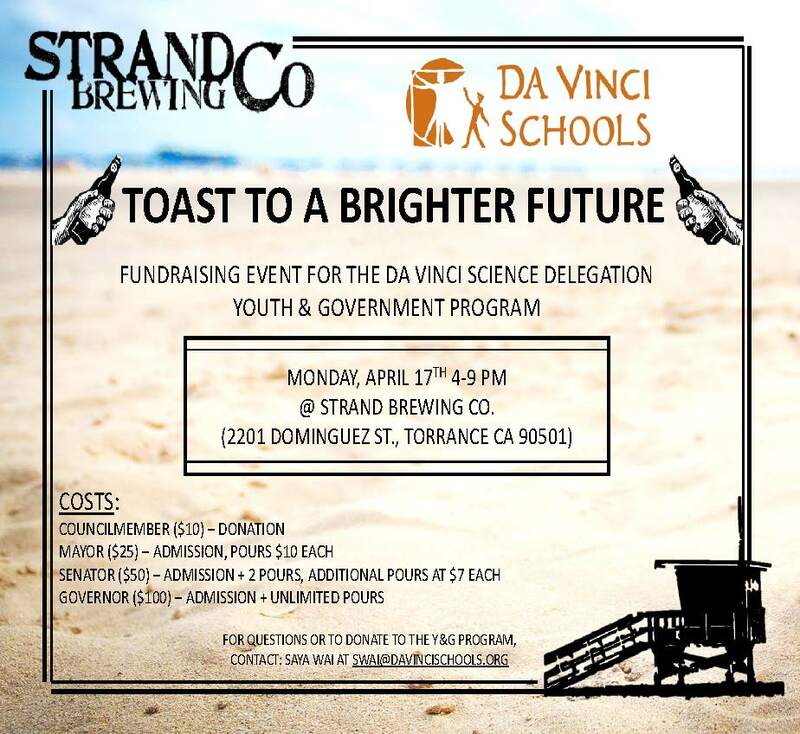 Our Youth & Government Fundraiser at Strand Brewery in Torrance is on Monday 4/17 from 5pm-9pm – please invite your friends and co-workers to save the date and join us to support this fantastic program! There’s never been a better time to support Da Vinci Schools! Thanks to the extraordinary generosity of Belkin, Northrop, Chevron, Gensler, 72andSunny, Kinecta Federal Credit Union, and Continental Development, all gifts to the Da Vinci Schools Annual Fund will be matched dollar-for-dollar, up to $75,000. Make your donation or pledge by April 30 and your gift will be DOUBLED. Every gift makes a difference. Please consider making a tax-deductible gift or pledge today by clicking this link (http://www.davincischools.org/makeagift.shtml). We thank you! See the attached flyers for information about summer jobs and internship opportunities – help get your child get up and out of the house and building their resume this summer! There is also a “Blueprint for Success” Job Fair on Thursday, April 27th from 9:00a-12:00pm at 801 E. Carson St, Carson, CA 90745. 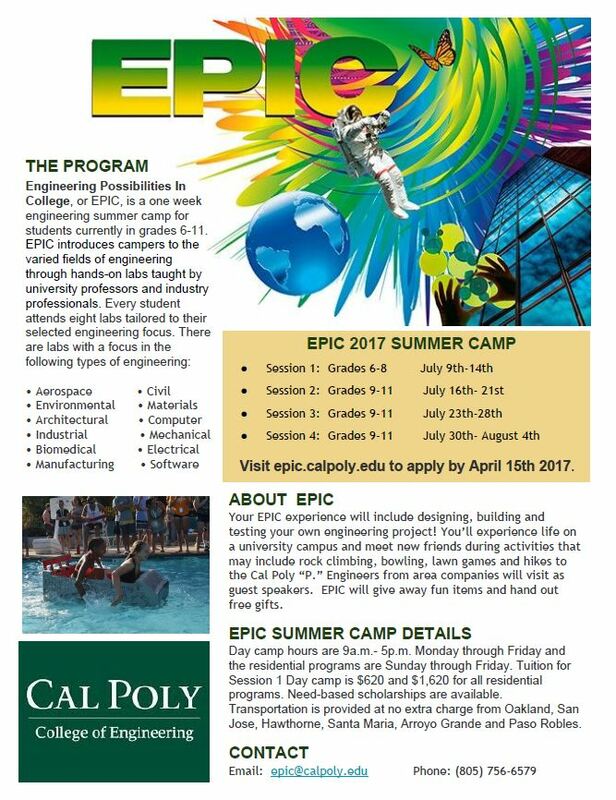 To sign up, students should email Ms. Morse at nmorse@davincischools.org by April 18th. Transportation will be provided. Week 28 is Spirit Week! There is also a blood drive on Wednesday, and the FRC Robotics Competition in Long Beach begins Friday! Also, you can still make your donation or pledge to the Da Vinci Annual Giving Campaign by April 30 and your gift will be DOUBLED. Every gift makes a difference. Please consider making a tax-deductible gift or pledge today by clicking this link (http://www.davincischools.org/makeagift.shtml). Thank you! 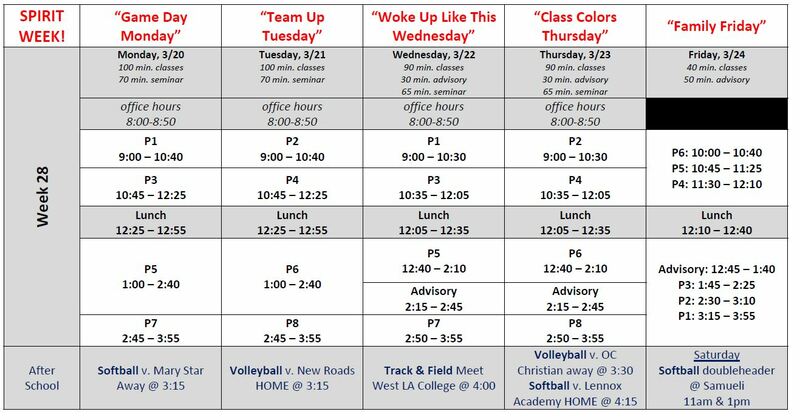 Here’s the schedule for next week – Friday is a professional development day for staff, so there will be no school for students. Next Friday is also the Da Vinci Spring Semi-formal Masquerade Ball at the Lawndale Community Center from 7-10pm. Tickets are on sale now for $15. This event isn’t just for DVS parents – invite your friends as well! (All must be over 21) Come on out and support our Y&G program while enjoying terrific local beverages! Make your donation or pledge by April 30, 2017, and your gift will be doubled. All of our schools’ day-to-day needs depend on Annual Fund gifts – from hands-on curriculum and innovative technology, to field trips and college visits, to a $1,000 materials budget for every Da Vinci teacher. All pledges must be paid by June 1 to be eligible for the match. Thank you to all of our parents who attended student-led conferences this week! Office hours, seminars and after-school tutoring resume next week.